The West Lancashire Masonic Classic Car Club have held their annual ‘Members’ Run’. The report which follows has been provided by Adrian Dean, the society’s Communications Officer. Three classics of different decades. From left to right; Jowett Jupiter, Beetle Cabriolet, Mercedes Pagoda. 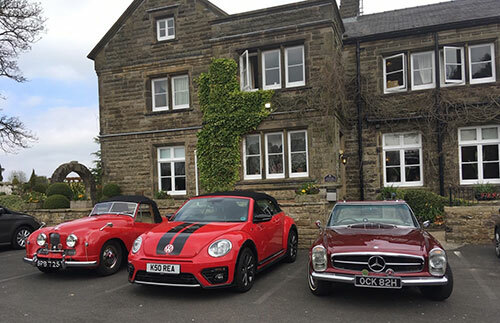 Adrian reports: “This was our first visit to Ferrari’s Country House Hotel & Restaurant, which is located in the small village of Thornley in the beautiful Ribble Valley. The property was previously named Blackmoss House and was built by the Earl of Derby in around 1830. The house was originally used as a shooting lodge and was part of Derby Estates until the late 1970’s. Set in four and a half acres of mature walled gardens, the hotel and restaurant have recently been extensively refurbished. We did not explore the walled gardens, so this will have to wait for our next visit. It was a well-attended meeting with 16 members and guests enjoying the early spring sunshine. We had been allocated a room all to ourselves. In view of the closure of Wellington Park, it was suggested by our chairman that next year’s AGM should be held here because the room could be enlarged by opening the partition that formed one of the walls. This was agreed by those present. The matter of charitable donations was raised by our chairman who made some suggestions for further discussion at the next AGM. 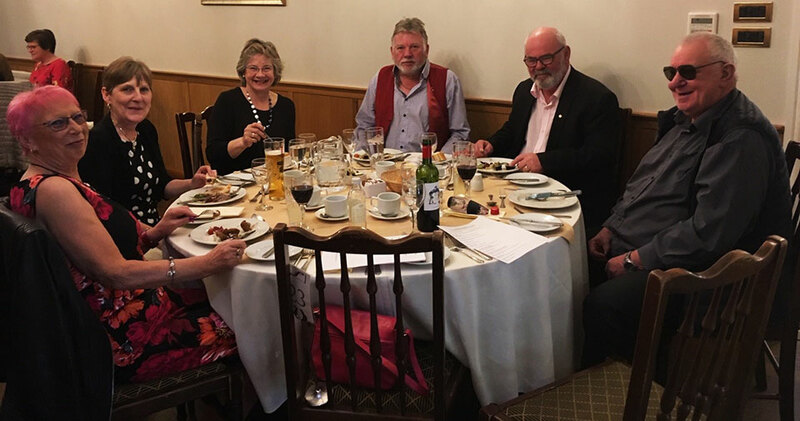 Pictured from left to right, are; Cath Read, Julie Miller, Lynda Mason, Stuart Mason, Ralph Miller and Dennis Read.